Leicestershire Rugby Union and the Royal British Legion proudly joined forces and came together to remember the fallen soldiers who fought in the First World War with a memorial rugby match between Leicestershire servicemen and the Royal Signals RFC, a representative Army team, from the Royal Corps of Signals. Coalville RFC hosted the event at their ground. It is the home club of the LRU current President, Mr Steve Rice, and boasts a great clubhouse with large terrace for invited guests and Leicestershire dignitaries to watch a day of military rugby which included an under 18’s match between a Leicestershire barbarian team versus Welbeck Military College, military guard of honour which included a two minute silence and last post, before the main match between the senior men. Invited guests in attendance included the Lord Lieutenant of Leicestershire, Mr Mike Kapur, OBE who was thrilled to be attendance as he is also a rugby fan. He comments “I can see how much work and organization went into yesterday not just to raise money for such a good cause, but also in reviving the memory and stories of some of those that we lost. I am extremely proud to have such fantastic, dedicated, and selfless people in my Lieutenancy area, providing much needed help to those that require it.” Mr Kapur presented every player with a commemorative pin badge designed especially for the occasion. Only players and guest received one of the badges. In total, there were around 100 guests from across the county including council leaders, volunteers, military leaders and the Lord Lieutenant of Rutland. Guests were welcomed by both Steve Rice, President and Barbara Crellin, President elect. The rest of the executive committee were on hand to make the guests feel welcome with a buffet before the under 18’s match kicked off at 12.30. Approximately 1000 people in total came to watch on the day and the main match was live streamed to You Tube for those who could not attend. The Leicestershire team comprised of boys from around the county nominated by their clubs, to play in a county shirt who may not have had the opportunity before. They played against Welbeck Defence Sixth Form College from Leicestershire. It was a tough game and considering Leicestershire had never played as a team before, they put up a great fight, but on the day, Welbeck were victorious winning 10-24. Before the main match, the British Legion created a guard of honour for the players to walk out to. Joining the senior players on the pitch were the under 18’s boys so that everyone could participate in a two minute silence and pay our respects to all who fell in the Great War, and all who have fallen since. The Kohima was read to all, followed by the sounding of The Last Post by a bugler. The match commenced between Leicestershire and The Signals and the crowd were treated to a match of fun filled rugby. Teams comprised of both serving and ex-serving personnel and all players enjoyed having a run out. It was clear early on, that the Signals were going to be hard to beat, but Leicestershire held their own and gave them a run for their money, but they could not quite catch them up and the Signals won 36-60, but the result didn’t really matter. 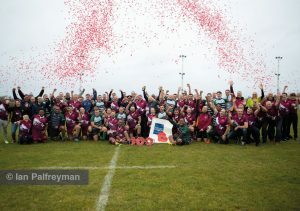 The aim of the match was to get everyone together through their love of rugby to pay respect for the fallen. Following the match, everyone was invited into the clubhouse where the Royal Signals were presented with a trophy to mark the day and both team captains were asked to cut a cake which was made and donated to the day by Jo Hancock, Coalville. Throughout the day, and beyond, Leicestershire Rugby Union are raising money for the Poppy Appeal. Approximately £3000 was raised on the day, but fundraising will continue throughout the season. The sale of a commemorative supporter’s shirt is expected to increase this figure significantly, along with other events and meals planned. A final cheque will be presented at the end of the season at one of the season finale events.